Today I got an e-mail from Sidney in Romania and she said Andrea supposed to arrive Romania today and she didn't because of her EX - Ricardo Biasotti (father of Anna). That what made me write this article. After Romania Andrea supposed to arrive to Italy to meet her FanClub, but it seems that the plan go wrong because of Biasotti. 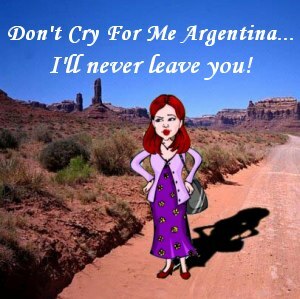 Biasotti won't let Anna go outside Argentina, and of course Andrea will not leave her there. Andrea also planned to fly back to the US once again to be with her sister and brother but again Biasotti go back to the picture. Sources in Romania also said they are planning to sue Andrea because she didn't come as planned... Andrea sent a video tape to Romania where she cry and tell about how she couldn't come to Romania.